If you were a kid growing up in the 80's or 90's chances are that one of your favourite movie franchises is Back to The Future. It had it all. Excellent plot, wacky Sci Fi, memorable characters, nice action, humor and of course, time travel! Since then I 've seen the movies countless times but they never fail to entertain me. Tell Tale games is a company that has given us some very good adventure games in the past few years, but Back to The future: The Game is their best so far! It continues the story of the movies with a brand new plot and contains all the elements that we loved about the 80s movies. All the cast is back. Marty, Doc, the Mcfly family, the Tannens and of course everything is taking place in the Hill Valley's past, present and future. 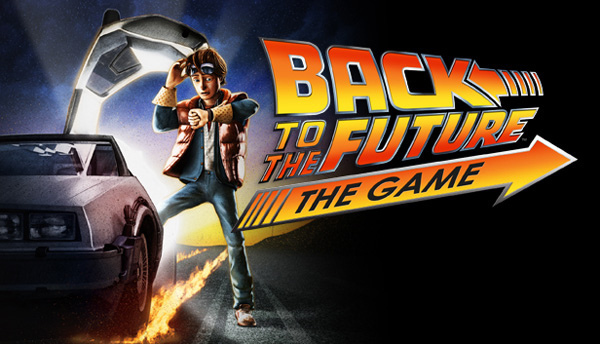 The game starts with Marty going back to 30s to look for Doc who has been lost and in the process to save him messes with the normal timeline. In the course of 5 episodes we get to fix things up and maybe even improve some aspects. I do not want to ruin it for you but the scenario is excellent and a worthy successor of the movies. Since it is an adventure games we will have to solve puzzles to progress the story but these puzzles are so well done and so well implemented in to the story that do not seem like distractions but part of the game plot. In my opinion this is how adventure game puzzles should be. They should not seem something that the designer put there to make your life difficult but something that your character should do towards his story goals. The game is not very difficult but it is challenging nevertheless. If you ever get stuck there is an in-game hint system with 3 levels so you can get some help without ruining the experience. The game looks beautiful. The cartoonish versions of the characters are convincing and the game scenes are rich with details that enhance the atmosphere. For each time period you will get a nice different feeling out of the graphics. The sounds and the voices are very well done as well. We have the actors of the movies' cast coming back to lend their voices once again and they do an admirable job in recreating the old magic. One thing that I did not like at first was the controls and direction of how the scenes changed while Marty was moving. It seems as though the designers kept in mind that the game would be released for consoles as well and they made up this unified control method that would work well with a console controller, but at the same time keep the old school point and click control method. After a while I got used it and I did not mind. Over all if you are a fun of the movies, or adventure games, this is a highly recommended purchase. It will keep you entertained for many hours and at the end you will see the all to familiar 'To be continued' that promises of an next installment to the franchise. I can't wait for it! In the men time Tell Tale is planning to resurrect another beloved franchise and transform it in an adventure game series, that of Jurassic Park. So, stay tuned!